In California, art can break out practically anywhere. That includes a downtown Los Angeles street, where an anti-gridlock traffic lane opens up impromptu street performance art possibilities. Photo courtesy of Krocky Meshkin/Flickr. Over the last three decades, the term “arts participation” has essentially been understood as arts attendance within the non-profit arts field. The field’s key indicator of arts participation over this time has been attendance at any of the seven “benchmark” arts events: performances of ballet, musical and nonmusical theater, jazz, classical music, opera, and visiting an art museum—at least once a year as measured by the National Endowment for the Arts’ (NEA) Survey of Public Participation in the Arts. But in this century, rates of attendance at benchmark arts events in California have steadily declined. Even attendance at a wider range of arts events, extending beyond the benchmark arts, fell 10 percentage points between 2002 and 2012 in California. Despite such statistics, there is considerable evidence of deep interest in the arts among California’s highly diverse population. What does a more complete picture look like? Two years ago, I led an effort, supported by The James Irvine Foundation, that used a more inclusive lens for looking at the landscape of artistic and cultural expression and experience in California. What we saw was profound, and involves the very meaning of arts and culture, and thus raises all kinds of questions about the future of the arts, of participation, and of the state itself. Detailed findings are available in two reports, A Closer Look at Arts Engagement in California and The Cultural Lives of Californians; here I highlight some key findings. Arts participation today isn’t only about sitting in a concert hall or pondering a painting in a museum. 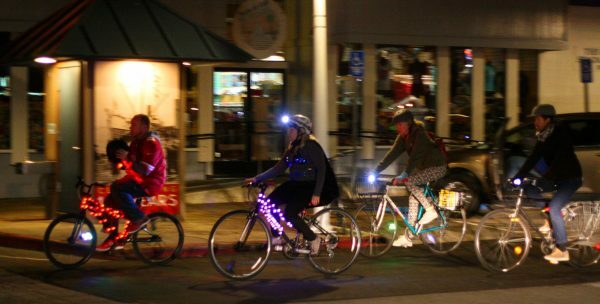 Bikers light up a night ride in Santa Cruz in 2015. Photo courtesy of Richard Masoner/Flickr. Across many different cultural contexts, two themes often appeared: choice and control. For example, using the NEA’s 2012 survey we found that the most popular venue for California adults to attend arts was in a park or open-air facility. Approximately one in four California adults attended an art museum, craft fair or visual arts festival, historic park or monument, or outdoor performing arts festival. These are all types of cultural events that tend to offer people control and choice over their own experience. They allow each person to handpick what to see and do, and afford degrees of flexibility as to when to arrive and depart, or whether or not to engage in different aspects of the event. Events that were less well-attended, according to the survey, were ones that tended to offer less control; they were activities that usually had precise starting and ending times, and that adhered to a set program. Geography also influenced choice. Even after accounting for socioeconomic and demographic differences among regions, we found that adults living in the state’s large urban areas were more likely to attend arts events in general. These regions also tend to have the highest densities of non-profit arts organizations, suggesting that issues of access also may be affecting rates of participation. Attendance rates are significantly higher for California adults living in the state’s urban regions, compared to those living outside of those areas, specifically for visiting art museums, touring historic parks or monuments, and attending musical plays, classical music, and jazz performances. Urbanites also were more likely to create visual arts (although those living outside of these areas are more likely to make textile-based art, such as weaving, crocheting, quilting, needlepoint, knitting, or sewing). There were other disparities in arts participation: Whites reported participating in art at the highest rates. But we found that educational attainment, age, income, immigrant status, and living in metropolitan areas are more important factors in determining arts participation than race or ethnicity. Indeed, the differences in participation among racial and ethnic groups could be largely explained by differences in education, household income, and an individual’s immigrant identity. Most strikingly, one’s level of education was the strongest explanatory factor for differences in rates across all arts participation measures. Having at least a college degree was the single strongest predictor of whether one participates in the arts. Can the digital revolution, a shift led by many California companies and institutions, change this? Trying to answer that question led to more questions. We found that the most common form of arts participation among California adults, as measured in the NEA’s 2012 survey, was consuming arts through electronic media, including television, radio, computers, or handheld or mobile devices. Seventy-seven percent of adults accessed arts electronically. Back then, the rate of consuming arts was almost 1.5 times the rate at which California adults attend live arts events (53 percent) or make art (54 percent). The distinctions between artistic genres are blending and blurring over time. Art creators do not necessarily assign themselves to a genre or even a precise artistic form, and classifications are seemingly less relevant for audiences as other dimensions of arts experiences … come to the fore. But five years ago is a long time. And the ways in which we describe and understand digital technologies as new means of consuming, interacting with, and creating art are evolving as technology changes. The ability to choose when and how to participate is central to the digital word. And that choice is in turn changing the definition of cultural participation, while enabling new forms of art. Platforms such as online gaming, crowdsourced art, writing and posting fan fiction, and sharing YouTube content (either self-created or otherwise) are forms of online cultural and arts participation. And digital is only one force changing the meaning of arts participation. As attendance at benchmark events declines, arts participation through the making of art and creative expression is palpable. In 2012, 54 percent of California adults engaged in art making. The most commonly reported art making activity in California was social dancing (African Americans had the highest participation rates in social dance compared to any other activity measured in the NEA’s 2012 survey). The range of artistic activities and forms of creative and cultural expression that are meaningful to Californians – and to people across the U.S. – demands that the term “arts participation” become more elastic. We must consider the many ways that people engage with art and artistic forms. For example, there are a large number and variety of folk arts in which people take part, though they have not traditionally been captured in arts participation studies. These activities often are passed along through family heritage. For example, an important part of traditional Hmong cultural activity, among Southeast Asian immigrants in the San Joaquin Valley, is a private home ceremony that involves playing the qeej, a bamboo mouth organ. (More about widening the aperture for what is considered arts participation is available here). Not long ago, I conducted a study with Chinese and Chinese Americans in Chicago’s Chinatown who had reported low levels of arts participation in standard surveys. But in interviews for the study, they revealed their participation in a great variety of artistic and creative activities. For example, an interviewee shared that he had attended an exhibition of Chinese calligraphy at a library, but that he was not sure whether that could be counted and reported when he was asked a survey question about whether he had visited an art museum or gallery. The gap between survey responses and the reality of our interviewee’s activities highlights the need for terms and research tools that better reflect what is happening in today’s society. The distinctions between artistic genres are blending and blurring over time. Art creators do not necessarily assign themselves to a genre or even a precise artistic form, and classifications are seemingly less relevant for audiences as other dimensions of arts experiences—particularly having more control and flexibility over arts activities and experiences—come to the fore. Jennifer Novak-Leonard, PhD, conducts research on the role of cultural and creative expression within public policy and enterprise. She specializes in the development and use of novel measurement systems to understand cultural participation and the personal and public values derived from those experiences. She recently joined the faculty of Northwestern University. For more information about any of the research mentioned in this article, please email jennifer.novak@northwestern.edu.